How would outstanding areas be degraded by gold mining? Gold mining generates huge volumes of hazardous waste (tailings), which is dumped in a tailings dam. The gold is only a tiny proportion of the material extracted, less than 10 parts in one million. The gold is extracted using cyanide, so safe storage of the mine waste poses a serious problem. Waste rock (overburden) that is not processed, as well as the highly toxic processed waste is hazardous. Processed rock takes up several times more volume once extracted. The tailings stay toxic for thousands of years. See a short aerial video of the Newmont Waihi Gold Tailings dam to get an idea of the massive scale of the hazardous waste that is generated – 40 million cubic meters. 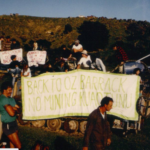 Damage to unstable areas: Gold mining often takes place in unstable hilly areas, where the gold-bearing rock is found, so any new mines are likely to be situated in particularly sensitive areas of the Coromandel. Earthworks for mining roads and industrial developments will also be harmful in steep valleys and water catchments. Mining can cause serious long-lasting water pollution through acid mine drainage. Copper, lead, zinc, cadmium and arsenic can leach out when water contacts the exposed rock in mine workings or tailings. This pollution is very serious and can be a problem that remains long after a mine is abandoned. 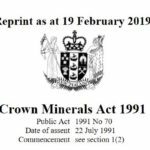 On Mt Te Aroha, poisonous waste – from just 90,000 cubic meters of tailings of the Tui mine, (which was abandoned in 1970 when the mining company went bankrupt) , is costing taxpayers over $17.5 million to attempt to fix. The Martha Mine will have over 40 million cubic meters of toxic tailings. Which means the Tui Mine tailings are just 0.225% of the volume of the Martha mine tailings ! The sheer scale of the toxic legacy of modern mining, and enormity of the costs of attempted remediation, is the main reason why there should never be tailings dams on the Coromandel. Heavy metal pollution could affect fish life and aquaculture in the Firth of Thames. Huge disruption: People are affected by noise, vibration, and heavy truck movements as the toxic tailings are carried to the processing plant and tailings dam. Options that have been proposed for the Onemana mine include at least 25 truckloads daily moving down the Coast road from Onemana to Waihi and back. Costs vs benefits: Royalties from gold mining are minimal; $956,998 in 2007 for all of NZ according to the Ministry of Economic Development. Tourism earned the Coromandel $21 million last year and from 2004-2007, the NZ DOC estate returned $22.5 billion to the economy. Waihi has a social deprivation index of 10 – which means this mining town has the highest possible level of deprivation and poverty. The unplanned effects of modern mining are major problems. Waihi streets collapsed into underground caverns because of the impact of the Martha Mine. The Golden Cross mine at Waitekauri was abandoned because the tailings dam at the top of the valley started to move. When the money and miners have gone, the mess will remain.